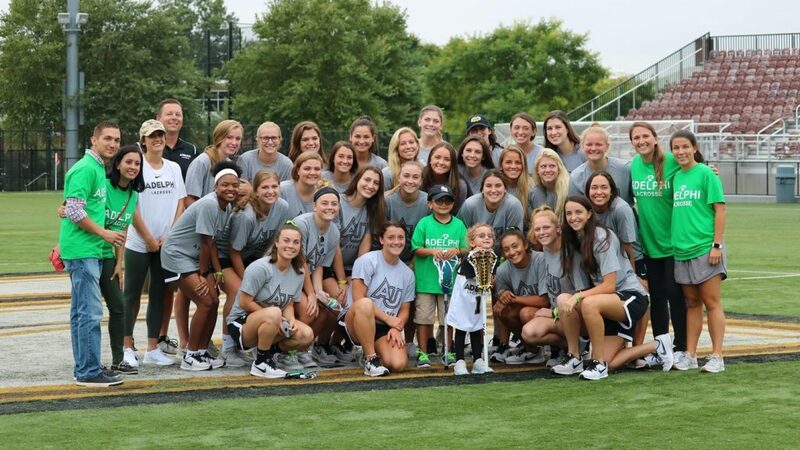 Garden City, N.Y. – With a little help from an organization called Friends of Jaclyn (FOJ), the Adelphi University women’s lacrosse program added another star to their 2018-19 roster, in the form of five-year old Alexia “Lexi” Corvino, who suffers from a very rare and complex form of Mitochondrial Disease. Not only did the team “adopt” Lexi, but welcomed her mom, dad and older brother Frankie on a cool Friday in early September. In 2004, nine year old Jaclyn Murphy was diagnosed with a medulloblastoma, a malignant brain tumor. Through chance events she became connected to and later adopted by Northwestern Univesrity women’s lacrosse team as an honorary team member. The team went on to a perfect season, winning their first NCAA national championship in 64 years. “The entire coaching staff at Adelphi have done more than just enhance the lives of the Corvino family — they’ve just put into motion the development of leaders both on and off the field,” commented Murphy. Melissa Cornivo, Lexi’s mother spoke to the group and explained what her daughter battles every day after being diagnosed with this rare disease. The team enjoyed dinosaur nuggets with ketchup – Lexi’s favorite- and funfetti cupcakes before heading out to Motamed Field to take some photos and play some games. “For starters, I never truly understood the meaning of toughness until I met Lexi, or as we like to call her “Lexinator,” said senior captain Chelsea Abreu. To learn more about Lexi’s Might to Fight or Friends of Jaclyn, use the links at the top of the page. Adelphi University joined the Northeast-10 Conference in the fall of 2009, and in the past eight seasons, has collected 27 regular season conference titles, 29 tournament championships, 41 individual crowns and captured the Northeast-10 Presidents’ Cup four times (2013, 2014, 2016 and 2017), while winning six NCAA Division II National Championships. For the latest on Adelphi University Athletics, follow the Panthers at www.aupanthers.com or via social media on Facebook, Instagram, Twitter, YouTube, and Snapchat.